When the sun goes down in Kuala Lumpur, burger stalls become a crowd puller. 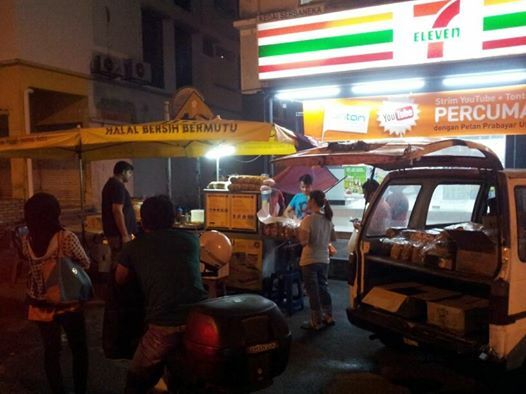 In Malaysia, there is a strange relationship between burger vendor and 7-Eleven. Burger vendors choose to set up their stall in front of the convenience store because 7-Eleven is a landmark (easy to remember) and it is the only place that is still bright at night. There seem to be a tacit agreement between the burger vendor and 7-Eleven. If you notice, burger stalls normally do no sell beverages. If the the customer want to buy some drinks, they will have to go inside the convenience store and that’s the economics of having a burger stall in front of the 7-Eleven. In Malaysia, it is largely a takeaway culture as there are no seats for you sit down to enjoy your drink and burger. In Indonesia, there are attempts by minimart chains Alfamart and Indomaret to place eatery stalls in front of their outlets to drive footfall. This strategy is largely necessitated by the lack of ready-to-eat offerings in minimarts. However, this strategy is not required for conveniences stores. It has become a trend for young Indonesians to hang out at convenience stores after dark. Ample of food and drinks as well as seats and WiFi are the reasons why they choose to nongkrong (hang out) at convenience stores. There is no such crowds at Malaysia’s 7-Eleven but things are changing. Newer renovated stores now come with extra seats and are selling more ready-to-eat food but none of the food can compete with the burger where some stalls have become the place to go for makan (eat) after dark. Perhaps 7-Eleven in Malaysia can do a promotion for burger customers by offering them with a discount for beverage purchases.